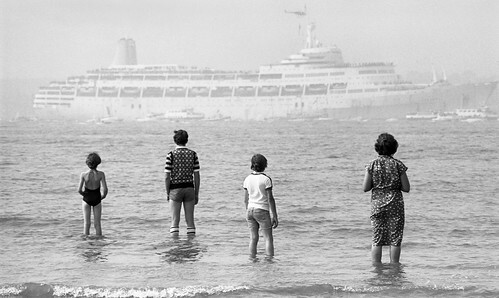 30 Years Ago Today on the 11the of July, a very tired looking Canberra, was greeted by a huge flotilla in Southampton Water celebrating the return of troops from the Falklands Conflict. Her return very much signifying the conclusion of the 10 week war against Argentina regarding the rightful ownership of the island, the Canberra having been requisitioned on the 9th of April as a troop ship. The day of her return was a splendid sunny but hazy day, not a heat wave, but never the less a comfortable temperature, the type of day, which, with this year’s prospect of the wettest and coldest summer ever summer seems almost as remote. Mid morning I cycled up to the beach near Woolston on the edge of Southampton water, to record the return of our chaps. Whilst I expected a good turn out, I was warmed by the huge number of people on the beach, many with what appeared to be personal messages to those returning. Sadly looking at these photos 30 years on, I cannot help but see parallels with the present day Afghanistan with some of the imagery. To see what I recorded, follow this link. Camrail 2012 - such fun!